Fans won’t be disappointed by the newest film in the Harry Potter series. I saw it last night. It was fantastic. Of a possible four stars, I give it four and a half. Lauren and I went with our friend Scott, who had actually seen the film already but liked it so much the first time, he wanted to see it again. And with theater tickets at ten bucks a pop, a willingness to see a film twice in the theater is no small praise. Harry’s forced participation, as anyone who has read the book knows, is all orchestrated by dark wizards hoping to return the mack-daddy of bad wizards, Voldemort, to power. The stages of the competition are so suspenseful that I found myself grabbing Lauren and bringing my hand to my face in a oh-no-Harry’s-going-to-get-it-for-good gesture. This is edge of your seat action. But action sequences don’t make a movie. Great movies are the result of great storytelling, and Goblet achieves that and then some. For starters, the characters and performances are believable, with particular kudos going to our three stars: Harry, Ron and Hermoine. Hermonie has always delivered, but Harry and Ron are finally keeping pace, showing emotion that most actors their age can only dream of pulling off believably. And, yes, the emotion is high in Goblet. Bad things happen. Terrible things. People get hurt. And evil is more apparent than in any other Potter film to date. This movie earns it’s PG-13 rating. But thank goodness it did. Anything less would have been water-downed grade-school pandering. 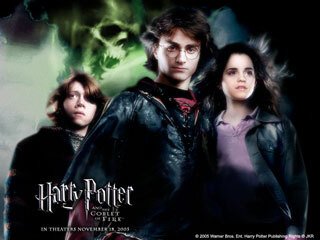 This is a coming-of-age story for Harry, and director Mike Newell delivers exactly that. Look for other great performances by Brandan Gleeson as Mad Eye Moody, the new Defense Against the Dark Arts Teacher, and Miranda Richardson as Rita Skeeter, the self-loving tabloid writer for the Daily Prophet. Oh, and watch for the unrecognizable Ralph Fiennes as the Dark Lord himself, who is actually more evil than I could have imagined him. Don’t bring the kids for this one. They won’t sleep for days. So the Potter films have improved with each installment. Goblet is the best to date. If the franchise can keep that up, I’ll be a very happy fan indeed.